Northwest (including Amoskeag Village, also known as “Skeag”), is a neighborhood located on the northern end of the Manchester’s West Side. This largely suburban neighborhood is bordered by Hooksett to the north, the Merrimack River to the east, Rimmon Heights to the south, and the Goffstown town line to the west. This neighborhood contains the largest swaths of undeveloped land in the city. The first mills in Manchester were once located here in the former Amoskeag neighborhood. 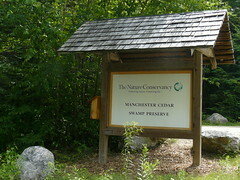 Northwest is home to Cedar Swamp Preserve, 602 acres in Hacket Hill that contains trees more than 450 years old. In 2009, the Maxwell Pond Dam was removed in an effort to restore Black Brook. Maxwell Pond was created in 1900 when the dam on Black Brook was installed. Black Brook is a habitat for alewife, American eel, blueback herring, Atlantic salmon, and other native migratory fish.